Getting ready for winter? As you enjoy the season’s final weeks of sea and sunshine, start preparing to winterize your boat. Moisture and acids in old oil will pit bearings and other engine parts while in storage, so you need to drain it. First warm up the engine, while in water, so more of the dirty oil will drain out and impurities will flush out more easily. Then use high-quality oil and filters as recommended by your engine’s manufacturer. For 4-stroke outboard motors, change the oil and filter before storing for the winter. To prevent damage from expanding water when it freezes, you must drain water from your engine. For inboard and sterndrive engines: Flush the engine with clean water by using water muffs or a similar device to connect a garden hose to your cooling system. (Never run a water engine without water). Then flush until the engine reaches normal operating temperature. Next, remove drain plugs. These are usually located in the engine block and manifold. You may also need to remove the water pump hose to drain remaining water. For outboard engine maintenance: First, make sure all drain holes are open. Then start the engine and clean the cooling system by flushing it with fresh water. (Use water muffs or a similar device connected to a garden hose.) Flush for a few minutes. Fuel can deteriorate in as little as 60 days, causing gum and varnish to build up in your engine. This results in hard starting, poor performance and reduced engine life. The easiest way to prevent these problems is by adding a high-quality marine fuel stabilizer to prevent fuel deterioration. Then fill the tank with fresh fuel to prevent corrosion-causing water condensation. Simply run the engine for a few minutes to get treated gas throughout the system—either when your boat’s in the water or while using a fitting designed to run the engine with a garden hose. Note that draining gasoline does not prevent varnish formation in engines since some fuel is always left behind. In addition, gaskets can dry out and cause leaks in the spring. While in storage, engine oil drains away. This exposes internal engine components to harsh elements in winter and can lead to corrosion and metal-to-metal contact, called cylinder scuffing, come spring. To prevent these issues, use a fogging oil spray. 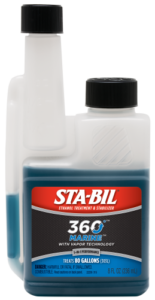 This type of product is specially formulated to penetrate deep into the engine and coat parts with a protective layer of anti-corrosive compound. Drain the lower unit of old gear oil and replace with a fresh supply. When changing the gear oil, be sure to check for moisture. If water comes out first, or if you see milky or lumpy oil, this is an indication your boat is experiencing moisture contamination and will need new seals before next season. Find your engine’s grease fittings (most will be located in the steering mechanism area), then use a quality marine lubricant to protect against rust, corrosion and oxidation. Check your owner’s manual to be sure you don’t miss any important areas that need to be greased before winter storage. 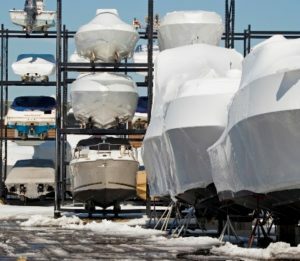 Boatyards receive little traffic in the winter, which makes break-ins easy. Remove all valuables, including expensive electronics. It is also in your best interest to insure your boat, even when it’s not on the water. 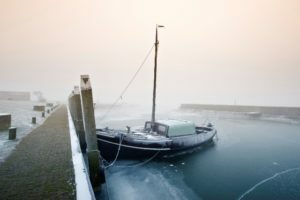 The best place to store your boat is in dry storage, but this can be expensive—especially in areas with long winters. At a minimum, you’ll need to cover your boat with a durable cover. Another good option is to shrink wrap your boat. For more maintenance tips and how-to’s, visit the boat care section here on the blog and watch our expert videos on YouTube.